Previous image, 13 total items. Next image, 13 total items. 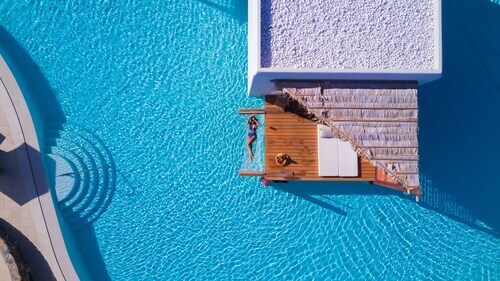 The island of Crete is packed with popular holiday towns, from pretty Chania to picturesque Malia, which is a world-famous haven for beach bums. Spend some time exploring the busy streets of Heraklion, though, and you’ll discover a place that ticks every box when it comes to city holidays. Museums and sightseeing spots abound, but it’s the excellent food and authentic urban vibe that make Heraklion a truly special destination. From Heraklion Airport, the city centre is just a 10-minute drive. Here you’ll find the oft-photographed Morosini Fountain, the expansive Archaeological Museum and a pedestrian area known as Korai Street, renowned for its run of cafés and bars. Head out towards the water and you can tour Heraklion’s fortress, which perches at the entrance of the old port. This fortress had a stern defence since it was once equipped with more than 40 cannons. 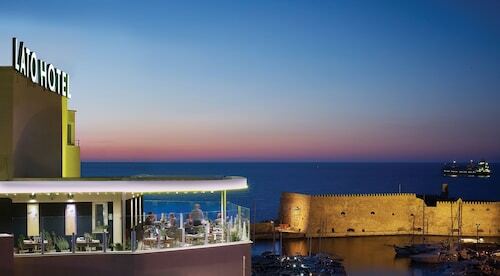 Heraklion holidays are steeped in history. To experience the historic side of Heraklion take a walk along the remains of the Venetian city walls, stopping to visit the grave of Greek writer Nikos Kazantzákis. History buffs should also make time for a trip to Knossos, a Bronze Age archaeological site and the main centre of Minoan Crete. For the best experience of this magical place, arrive early in the morning and leave several hours to tour the Palace of Knossos and its surrounding buildings and grounds. When sightseeing has tired you out, it’s time to hit the beach. Heraklion’s centre is short on sand, but if you head west to the Pankritio Stadium you’ll come to Ammoudara Beach. This long stretch of golden sand is perfect for lazy days in the sun but is also well-suited to water sports enthusiasts. To the east, Karteros offers a Blue Flag beach with plenty of nearby taverns and bars. Lastly, for nature lovers seeking secluded walks, there’s the uninhabited island of Dia, which is accessible by boat from Heraklion harbour. The main island, meanwhile, boasts beautiful Rouvas Forest, just an hour’s drive southwest from Heraklion. Crete is full to the brim with great beach destinations. Check out all our cheap beach holidays to Crete. If you like Crete then you're sure to love the popular beach destinations on mainland Greece. Check out our all inclusive holidays to Heraklion, Mykonos beach holidays and other top Greek beach destinations. Don’t miss this ornate fountain in Heraklion’s central square, which once brought daily drinking water to thousands of inhabitants. The prominent symbol of Heraklion, this imposing fortress by the harbor has protected the city for over 500 years. Stroll around one of the best-preserved Minoan palaces in the country and learn how this ancient civilization lived. Don’t miss the chance to learn about Crete’s unique natural environment at this excellent modern museum. Take a look around this stunning Venetian monument, also the site of the Heraklion town hall. Explore the ruins of this once-glorious palace. Imagine it in its heyday as royals and courtiers moved around its spacious rooms. Spend an afternoon wandering around this ancient harbor and admiring the fortress and ancient walls or take a trip to one of the nearby islands. One of Europe’s most important museums has five millennia of Cretan history on display, including the exceptional Minoan exhibit. Take a tour around one of Europe’s most spectacular archaeological sites, where Greek myths have been made and great treasures discovered. Step away from the crowds and visit this grand cathedral, seen by many as a symbol of the Cretan revolution. Trace the history of this ancient town through its numerous periods and discover traditional art and fascinating stories. Be sure to visit this ancient drinking fountain that served Heraklion for several centuries. Discover the enchanting world that lives beneath the sea when you visit one of Europe’s finest aquariums. The birthplace of one of Greece’s most famous artists displays reproductions of his works. Learn about his life and artistic career. Take a walk around Heraklion’s ancient fortifications, which protected the old city from invasion for centuries. One of the most important Venetian monuments in Heraklion, this former cathedral now houses the city’s Municipal Art Gallery. 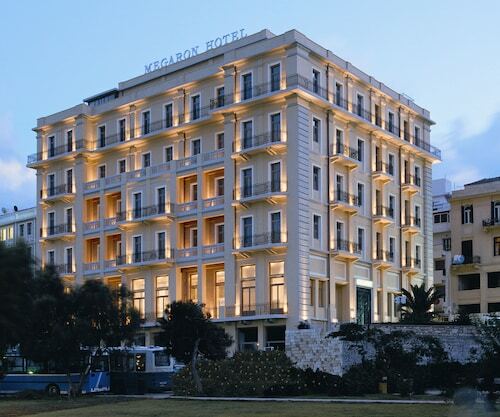 Located in the heart of Heraklion, this luxury hotel is within a 10-minute walk of Museum of the Battle for Crete and National Resistance and Heraklion Archaeological Museum. Heraklion Port is 0.5 mi (0.9 km) away. 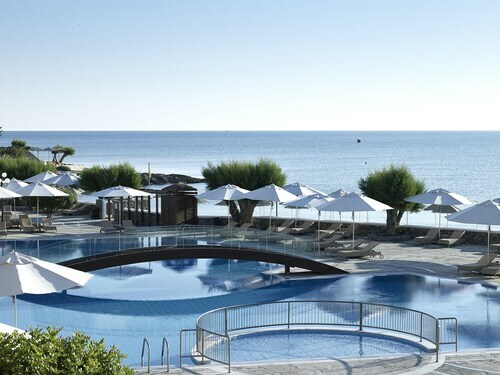 Situated near the beach, this luxury hotel is 2.4 mi (3.8 km) from Ekklisia Agios Konstantinos and within 6 miles (10 km) of Crete Golf Club and Convention Centre Creta Maris. Aquaworld Aquarium and Port of Hersonissos are also within 6 miles (10 km). 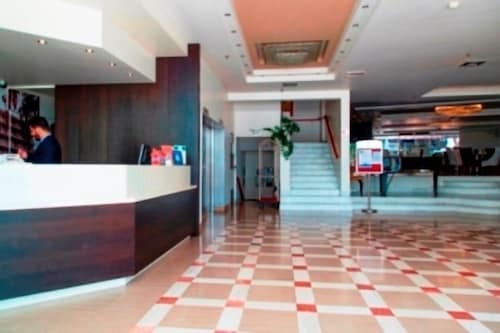 This family-friendly Heraklion hotel is located near the airport, within a 15-minute walk of Manos Hatzidakis Theatre and Heraklion Archaeological Museum. Heraklion Port is 1 mi (1.7 km) away. 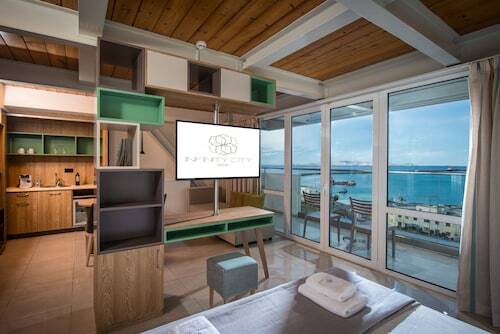 This family-friendly Heraklion hotel is located in the historical district, just steps away from Eleftherias Square and Heraklion Archaeological Museum. Heraklion Port is 0.8 mi (1.3 km) away. Located in Hersonissos, this beachfront resort is next to a golf course, 0.4 mi (0.6 km) from Convention Centre Creta Maris and 1.5 mi (2.4 km) from Star Beach Water Park. Port of Hersonissos and St. Paraskevi Church are also within 10 minutes. Situated in Heraklion, this boutique hotel is within a 10-minute walk of 18 Anglon Square and Heraklion Archaeological Museum. Heraklion Port is 0.5 mi (0.8 km) away. 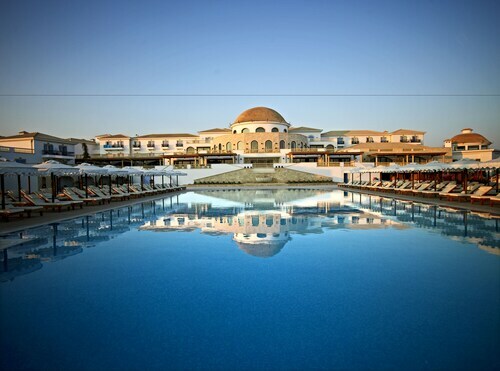 Situated in Hersonissos, this all-inclusive resort is within 3 miles (5 km) of Sarandaris Beach, Convention Centre Creta Maris and Port of Hersonissos. St. Paraskevi Church and Aquaworld Aquarium are also within 3 miles (5 km). 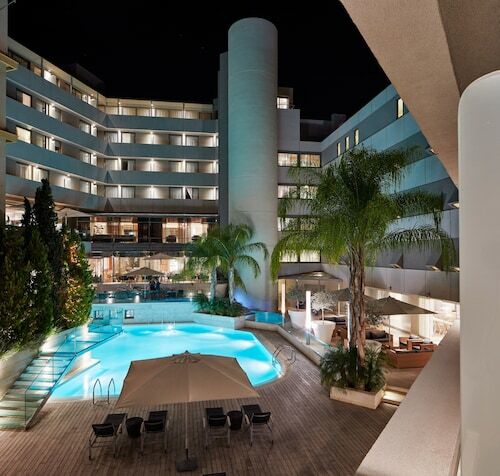 Located in the heart of Heraklion, this hotel is within a 10-minute walk of St. Titus Church (Agios Titos Cathedral) and Heraklion Archaeological Museum. Heraklion Port is 0.6 mi (1 km) away.